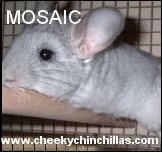 These beautiful creatures have more fur per square inch than any other known animal. 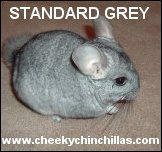 Today, there are many different colours, the Standard Grey chinchilla being the original colour. 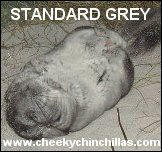 Below, I have listed some of the more common colours: Standard Grey The Standard Grey has black eyes, grey ears and a white tummy. 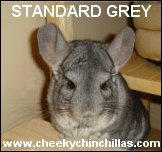 The 'grey' can vary from a lighter shade to a very dark grey. 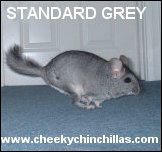 Wilson White This chinchilla has pure white fur, black eyes and grey ears. Pink White The Pink White has pink ears and red eyes. 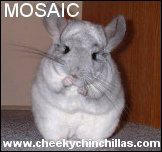 Mosaic A White chinchilla with grey patches which forms various patterns, grey ears and black eyes. 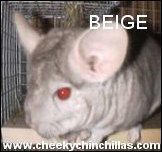 Beige Creamy beige colour, white tummy with pink ears and red eyes. 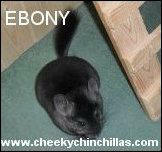 Ebony Black all over with grey ears and black eyes. 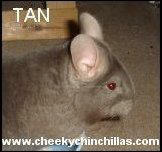 Tan Dark brown with pink ears and red eyes. 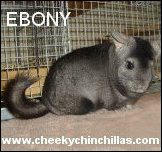 Black Velvet Black back and head going to darker grey sides, white tummy, grey ears with black paw spats, black eyes. 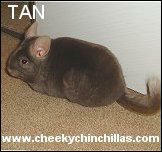 Violet Soft coat with a purple hue, white tummy, grey ears, black eyes. 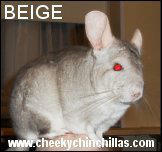 The fur looks very soft because there is no tipping.